Diatomaceous Earth, (DE), kills insects primarily by disrupting the waxy layers on their body. This causes excessive water loss and death by dehydration. DE is nontoxic to mammals including humans. Does Diatomaceous Earth work as a method of pest control? Diatomaceous Earth is effective in killing most bugs and crawling insects that have a hard waxy shell covering their bodies. This includes cockroaches, ants, fleas, bed bugs, ticks, various weevils, centipedes and scorpions. A few years ago I took a course in Pest Control Management from Purdue University and earned a certificate in Pest Control. That has been very helpful on our homestead. I will share some of what I learned with you in this article. Diatomaceous Earth is a white to off-white fine powder that is the shell of single-celled plants called diatoms. These plants live in large numbers in oceans and in fresh water. When they die the shell collects on the ocean floor or bottom of the lake or river.. These near microscopic shells, when dried, are covered with tiny spikes that do not penetrate human skin but disrupt the waxy layer covering a bug's exoskeleton. Diatomaceous Earth is a natural pesticide that only works when it is dry. When wet the tiny little spikes become flexible and ineffective at disrupting the waxy layer of the bugs exoskeleton. We have used DE many times as a natural pesticide and can attest to its effectiveness. There is more than one type of Diatomaceous Earth. You want to use plain food-grade Diatomaceous Earth (link to read reviews on Amazon), not the DE formulated to be used to filter the water in swimming pools or food-grade DE mixed with some other product. Also, the DE must be uncalcinated, that is it must not have been heat treated before the sale. If it has been heat treated it is not effective as a bug killer. Because bugs can hide in all sorts of cracks and crannies, you will need a method of applying the DE into those places. A really neat way to apply DE into cracks and crannies is to use an empty plastic mustard container. Get a plastic mustard container that has a long thin tip that is covered with a small cap. When the mustard is all used up, carefully wash out the container and let it thoroughly air dry. Fill it 2/3s full of food-grade DE, place the cap over the container and you are ready to go! Caution! Do not completely fill the mustard container. There needs to be air space inside the container to provide air to push the DE out forcefully when it is squeezed! To use your DE mustard container, shake it a couple of times, remove the cap and place the tip into the cracks and crannies or next to them and rapidly squeeze the container 4 or 5 times to send a blast of DE powder into the crack or cranny. Repeat this at weekly intervals until no more bugs are seen. This method is especially effective with ants and cockroaches. DE is a slow killer, meaning it can take longer to rid your house of bugs using DE than if you used a toxic, to humans as well as to bugs, spray or a bug bomb. The benefit is no residual to affect pets, small children and adults. To rid a dog or cat of fleas, dust the pet with DE. It is safe to use your hands and rub the DE into the pet's fur. A female flea can lay up to 400 eggs in a day. They are usually laid on the pet but fall off onto the ground or carpet if the pet is indoors. Since flea eggs can hatch in 2-3 days in warm weather, dust the pet every 3 days for a couple of weeks to rid them of fleas. If the pet is an indoor pet and your house has carpets, you need to dust the carpets with DE also. Vacuum the carpets the next day and repeat this for 2 or three times at three day intervals to rid the carpets of fleas. In cooler weather it may take a week for the flea eggs to hatch so you may also need to re-treat the carpets a week after the initial treatment with DE. DE can be used on wool carpets and rugs, upholstery, mattresses and even in the car if need be to get rid of fleas. Merely dust and then vacuum the next day and repeat 2 or 3 times to get the next generation of fleas that hatch from the eggs laid. Wash your hands and arms afterward. DE can cause dry skin and may irritate the skin of someone people if not washed off. As a precaution, avoid inhaling the DE as much as possible. If large amounts are inhaled it can cause coughing. If you have asthma or other lung problems, inhaling a large amount of DE can cause shortness of breath. Like any dust particles, DE can irritate the eyes. However, DE does not cut the eyes or make tiny cuts in the lungs if inhaled. This is because there is moisture on the surface of the eye and on the lining of the lungs. This moisture makes the little spikes ineffective as cutting devices. Besides using the mustard container with DE, as described above, sprinkle DE underneath stairs, sinks and in dark corners behind refrigerators. Cockroaches love dark, warm places that are near a source of moisture or if the places themselves are moist. Placing DE behind and around the edges of water heaters is another area to treat to reduce bugs. Anywhere there is a crack or where there are spaces between cabinets and floors are places cockroaches can hide. If you have a table that slides out to a longer table and the table leaves are stored under the table top, there can be cockroaches hiding there in the day time. All cracks, crevices and voids in the house must be treated to remove cockroach infestation. There are several types of cockroaches but the most common one in America is the German cockroach. They have a higher reproductive rate than most other species of cockroach. Their eggs hatch in 20 to 30 days, less in temperatures above 80 degrees F. They are very hardy bugs that have the ability to hide almost anywhere. Even with meticulous treatment with DE, it is common for there to be a resurgence of cockroaches in 3 to 4 weeks when a new generation hatches. Treat all areas where cockroaches can hide every few days for at least a month to get rid of infestations. Ants, being smaller bugs can hide effectively in areas accessed by the smallest of cracks. They can even nest on or inside the plastic or metal boxes inside the walls that hold electrical outlets or light switches. The method of puffing DE from the mustard container into cracks and crannies along with removing the cover plates on electrical outlets and light switches, placing a few puffs around and inside the boxes helps control ants in the home. It takes 4 to 8 weeks for ants to go from the egg stage to adult stage. Treatment needs to continue for at least this period of time. DE placed in a line just outside or inside of each entrance door of the home during warm weather can help reduce the amount of bugs in your house. A full basement can be another source for bugs. Dusting DE on the landing just on the basement side of the basement door will help eliminate bugs and centipedes. There is no danger of dogs or cats being harmed if they lick up DE. DE is one of the ingredients in some pet remedies for worms. So ingestion of DE does not harm dogs and cats. When bugs, ants, centipedes etc. walk through DE, some of it clings to their body taking it with them to their nest. In this way, they help in the demise of their offspring as well! With the exception of bed bugs, covered next, most hard shelled bugs found around the house can be eliminated over time using the techniques described in this section. To treat for bed bugs you must dust mattresses, memory foam if used and vacuum both the mattresses and memory foam a day or so later. It will take more than one dusting to kill all bed bugs. Depending on the temperature, bed bug eggs hatch between 6 and 17 days. This means there must be re-treatment with DE every 2 or 3 days for at least 3 weeks. In dusting mattresses pay special attention to folds, tufts, seams and any areas where there may be tears in the mattress fabric. The top, sides, ends and bottom of the mattress must be treated. If there is an enclosed box springs, any folds, seams and tears must be treated. To treat tears, put a few puffs from your DE mustard container into and around the tears. You must also treat the bed pillows. Be sure to dust the seams on the pillows. Unless the pillows have a fill that will be damaged by high heat, an alternative method is to place the pillows in a clothes dryer on high heat for 60 minutes. Pillows must be retreated along with the mattress for at least a 3 weeks period of time, both dusting or using the dryer. If the bed has cracks or hollow posts in the bedstead they should be treated with a few puffs from the DE mustard container. Any place where baseboards do not completely touch the walls, behind pictures, behind wall plates on electrical outlets and light switches, where light fixtures touch the ceiling, around window casing and medicine cabinets are hiding places of bed bugs. Bed bugs are not the easiest pest to get rid of. The area under and around the bed must be dusted with DE, especially if the floor is covered with a rug. These areas must be treated each time the mattress and memory foam are treated. Successful treatment requires persistence. 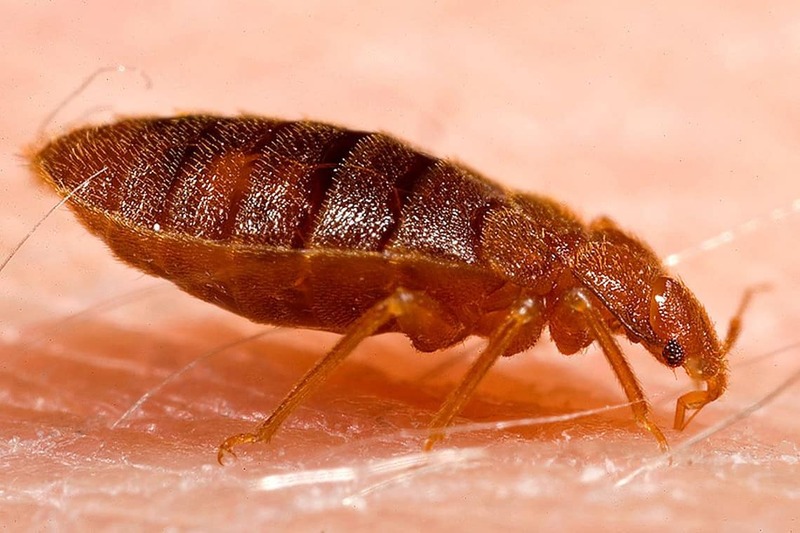 One reason bed bugs are so hard to get rid of is the adult bugs can live for one year or more without feeding and they can survive a cold winter in an unheated building. Diatomaceous Earth is very valuable for getting rid of bugs from stored food and grains. Even if there are no adult bugs when foods and grains are stored, there can be bug eggs that hatch during storage and the grain or food gets contaminated and eaten by the bugs. Storage of flour, wheat berries you plan to later grind into flour, other grains, and dried foods such as peas, beans, lentils, corn and popcorn can receive heavy damage from bugs that hatch from eggs during storage. We have used Diatomaceous Earth in our food storage for the last 20 years with excellent results! We highly recommend DE to protect your stored food. Food Grade Diatomaceous Earth (link to read reviews on Amazon), sprinkled throughout the food placed in the storage container or mixed in with flour can kill hatched bugs before they can do much damage to stored foods. Mixing 1 cup of DE to a 3 gallon bucket or 2 cups DE to a 6 gallon bucket of stored flour is sufficient. Food grade DE will not harm humans when eaten. Is Diatomaceous Earth Effective As A Bug Bait? DE is not a bug bait! There is nothing in DE that attracts any type of bug to it. Some people have mixed dry powdered sugar and DE in roughly equal amounts to use as a bug bait but have had only mixed results. DE works by the bugs passing through it and getting it on their hard shell where it disrupts the waxy layer and they desiccate and die. Is It OK To Sleep On A Mattress Treated With Diatomaceous Earth? After treating a mattress with DE, let it set for most of the day. Then place a clean mattress cover and sheets on the mattress before sleeping on it. Washing the mattress cover, pillow covers, sheets and pillow cases and drying them on high heat should kill any bed bugs or eggs on or in them. Mattress cover, pillow covers, sheets and pillowcases should be rewashed and dried on high heat every few days for at least 3 weeks. Why Does Diatomaceous Earth Take So Long To Kill Bugs? Remember, DE is a slow killer. It is not a poison, it disrupts the waxy layer of the bug's hard shell. This causes the bug to desiccate, dehydrate and die. This process is not instantaneous but takes time. The benefit to your homestead is you are not using toxic poisons that can affect you, your children, pets, other animals or plants on your homestead.